Hello, ASG members and fellow sewists. 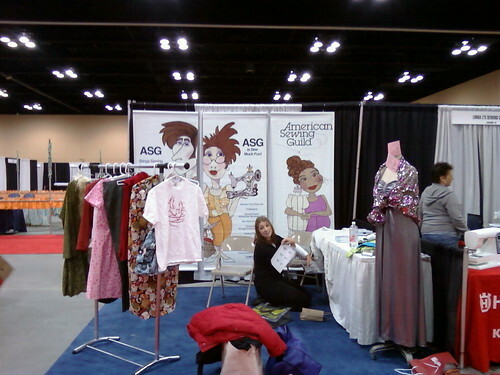 Tina and I spent most of the day setting up the ASG booth and checking out our fellow vendors. There is a very nice selection of fabrics, threads, and notions this year. Also, the ASG asked the Expo to display several garments from challenge winners at the 2010 National Conference in Atlanta. This body of work shows some amazing talent from ASG members across the U.S. Take a few moments to admire these pieces, especially the garments from one of our ASG Chicago chapter members. In our ASG Chicago booth we also have a few displays of work from members across the Chicago chapter to show shorts, pants, dresses, tote bags, teddy bears, altered ready-to-wear, and more. We’re very proud of the talents across ASG Chicago and hope that showing some of this work will encourage Expo visitors to become ASG members. The ASG “welcomes sewing enthusiasts of all skill levels and from many different walks of life” (Seriously. It says so on the website.). Because the ASG takes all skill levels, that’s why people can make ear-of-corn costumes or recraft a pair of pants to become a jacket or sew a prom dress for donation. You can be experienced, wildly creative, a strict pattern follower, or even a beginner and you are welcome here. If you have a friend, loved one, or neighbor who has talked about but never joined the ASG, then now is the time. When someone becomes an ASG member at the Expo his/her name will be entered into a raffle to possibly win tons of really cool sewing stuff valued at more than $200. So, if you encourage a friend to become a member and that friend wins the raffle . . . well, if you’re really good friends maybe you can share! Susan and I spent today setting up our ASG booth at the Original Sewing & Quilt Expo that started today with pre-conference workshops. The show is officially open March 31-April 2. Are you going to the expo? We’d love to see you at the booth, #619. Drop by and say hello! We're almost finished setting up. 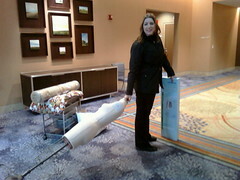 Susan carries in her mannequin to set up the booth. I’ll also be posting pictures from the Expo. You can follow along in real-time as I tweet them onto Twitpic or click the links in my tweets and you’ll be able to see them. I’ll also be posting them at the end of the day onto our Flickr album. If you see me at the Expo, take a picture with me! I’d love to see you! If you’re not a member of the American Sewing Guild, be sure to sign up in the booth. 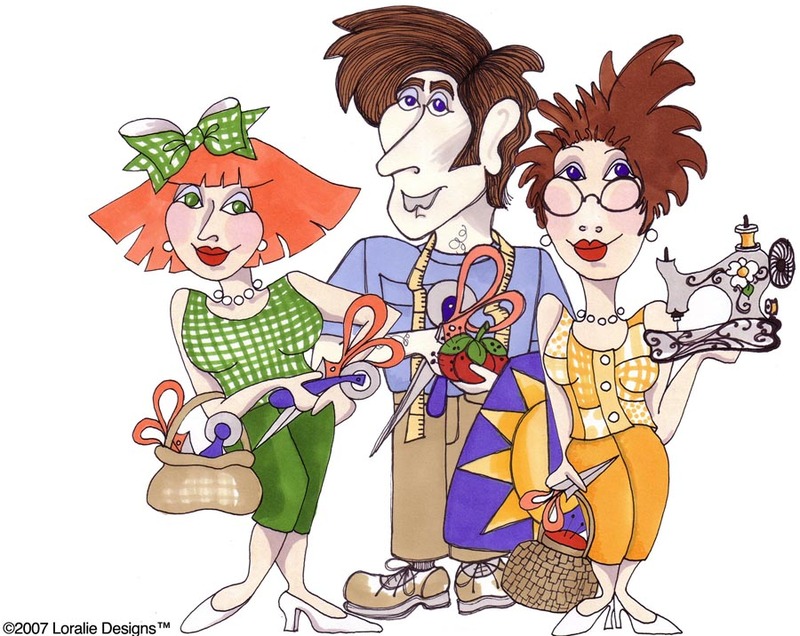 You’ll be automatically entered into a raffle for a gift basket of sewing notions worth more than $150. Already a member? Encourage someone new to join and maybe (s)he’ll split the basket with you! 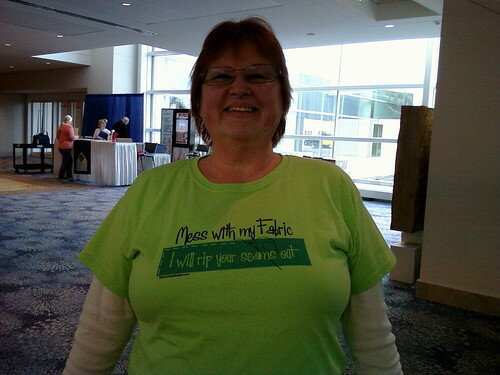 We love this t-shirt on our new friend, Elaine! ✄ ASG Chicago Chapter Booth Volunteer — Member volunteers will help promote the ASG and encourage membership or renewals for half-day or whole day shifts. ✄ Expo Ambassador Program Volunteer — Volunteer for classroom assistant, ticket taker, information desk assistant, set-up/tear-down assistant, sewing studio organizer, white glove gallery monitor, and general booth help for half-day or whole day shifts. The ASG Chicago Chapter will have a booth at the Expo and we need volunteers for the following times. The first two (2) volunteers to register for each section will receive a free general admission pass to the Exhibit Hall. The pass will be good for just the day volunteered. Section A: Thursday, March 31 – 10 a.m. to 1:30 p.m. Section B: Thursday, March 31 – 1:30 p.m. to 6 p.m. Section C: Friday, April 1 – 10 a.m. to 1:30 p.m. Section D: Friday, April 1 – 1:30 p.m. to 6 p.m. Section E: Saturday, April 2 – 10 a.m. to 1:30 p.m. Section F: Saturday, April 2 – 1:30 p.m. to 5:30 p.m. If you are interested in volunteering at the ASG booth, please email Susan Gerbosi. Be sure to give Susan your name, return contact information, date and volunteer section for the ASG booth. Visit the Expo website’s Ambassador Progam application page. Complete the online application and click “Submit” at bottom of page. Be sure to list your Group Affiliation as “ASG Chicago”. You may leave the Ambassador ID# section blank. You will receive an automatic email confirmation after you register. For your convenience, you can download the Volunteer Information and full details of the Ambassador Program Application. We hope our members take advantage of these volunteer opportunities as well as visit the Original Sewing & Quilting Expo. Be sure to stop by the ASG booth between classes or while you’re shopping. We’d love to see you! If you’re not an ASG member, come see us at our booth. 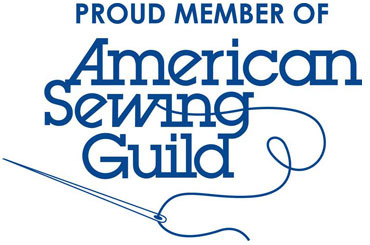 We’d love to show you what the American Sewing Guild means by “Advancing Sewing as an Art and Life Skill” and having fun learning and sharing with other members.